The current economic structure of our global society is based on consuming goods rather than using them. What is the difference? And why would the consumer type of economy be obsolete? And why should it be replaced by a user type of economy? What consequences does it have for our daily lives? And what consequences will we suffer if we do not change? Throughout the explanation I will fall back on a useful example: mobility. In this type of economy we simply purchase whatever we need for a living. This means that we take ownership of the goods. Consumer economy has evolved ever since the start of industrialization. In order to make products available to the consumers around the world we need to install an infrastructure for manufacturing the supplies, retail outlets, waste management of packaging and obsolete stuff, financial systems for payments, etc. 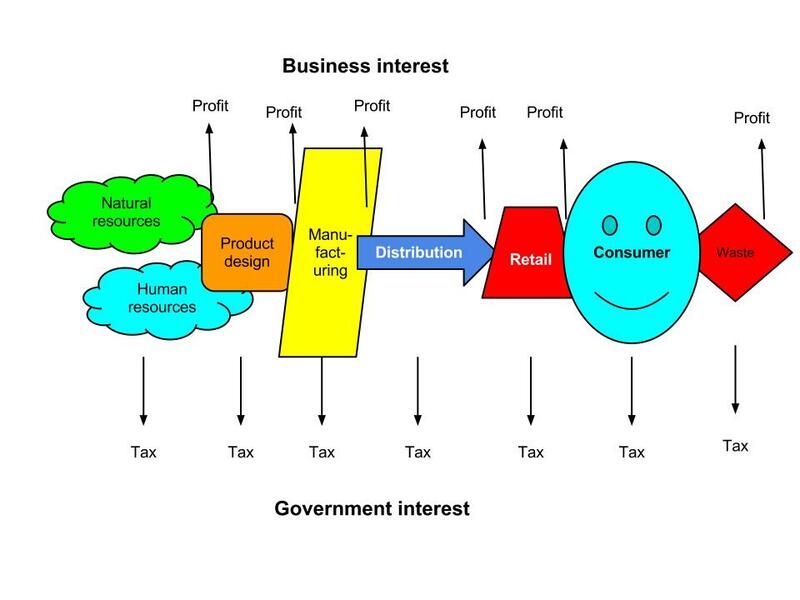 The relationship between the consumers who purchase daily needs, suppliers offering products and services, money systems providing cash and loans, governments providing infrastructures and regulations, is based on a composition of value added resources (products), logistics (distribution), financial profits and taxes. A business network that sells the products focuses on profitable consumption, the government that provides infastructures concentrates on taxable consumption. Business in each step of the chain needs more and more profits to attend the increasing demands of shareholders. Shareholders own the business and value their ownership through the return they get on their investment. As a consequence the business wants volume sales and cost reduction in a competitive environment. As a side effect this chain optimization causes increased environmental pollution. The effects on human nature are also negative. It causes constant purchase stimulus, creating a mentality of greed, thirst for financial means to purchase more and a mentality of hoarding. There is a growing degree of individualism, distrust, criminality and psychological disorder around “the having”. Governments see an increased need for infrastructures for logistics and retail activities but also suffer the negative consequences in health, psychological disorders and environmental pollution. The latter is demanding investments in rules, bureaucracy, police, health care, etc. This produces a steady increase in tax requirements along the chain to finance the growing social responsibility around purchasing power. Government hence stimulates further consumption through economies of growth in order to be able to finance the consequences (dual economy). Meanwhile the entire structure of society around fragmented money driven and dependent consumer interests, shows a steady increase in problems, such as the reduced availability of natural resources for the increased global productivity, destruction of the environment to facilitate more logistics, the pollution of our habitat and increased global competition. Consequence driven investments in a greener society do not reduce the push for more consumption, on the contrary, it stimulates it even more to cover the costs of those investments. Business and government both use it as marketing arguments to stimulate the economy of growth even further. It all helps to delay disaster but it cannot avoid it. Overconsumption in a consumer economy has a structural damaging effect and leads irrevocably to crises. Each of the fragmented pillars (government, business, etc) depends on the other’s growth, stimulating it according, increasing the problems faster than solving them internally in every fragmented layer or “slice” of interest. All the crises around the world are a consequence of an obsolete consumption driven system. The problem of this consumption driven economy is the chain of exchange of ownership all the way up to the end-user. On and between each of the shackles in the chain the business and government interests are keeping the system in place out of self interest. No one in the chain takes responsibility (nor can be individually blamed) for the effects on humanity and our planet. In between the shackles shortages appear that lead to speculation and further value destruction in the chain, increading economies while decreasing quality of life. Mobility is a consequence of our consumer economy. We privately need mobility for work, social activities, family logistics, recreation and purchasing goods. For each of our requirements we have a whole variety of mobile alternatives, instrumentally at hand. We have a car, a bike, a scooter, maybe even a caravan, a trailer, etc. We can only use one of these instruments at any one time but possess it for our usage at will during the day. We consider this type of mobility part of our democractic freedom. But do we need to own it? We seem unaware about the amount of resources that we block by keeping up a stock of individual mobility in our own ownership. The amount of space we need to store the options is tremendous, while not in use, while in use and when we arrive at our destiny. Not to mention the different types of infrastructures that are needed to provide safe usage. It all had an important impact on our economics for many decades. But also on our environment and health. This was countered by the growth of a consequences-economy in which healthcare techhnology managed to stretch our lives against a huge healthcare cost. Today we face the problem that polution, scarcity of natural resources and usage of productive landscape is so big that it has consequences for human health, social stability and sustainable human progress. The first has to do with mentality and the second with our social complexity. The economy is structured around our culture of possessions not for usage. If we want to change that we need to break up the chain, alter our culture and change our economic system all together. That is extermely difficult to do. This has significant consequences for our society. Let us simply look at the two issues I mentioned. We possess everything simply because our society is based on that culture. If we decide to relinquish possession we could not yet make use of alternatives because their is no reliable infrastructure based on that usage. When I want to move from A to B and have no car or bike available to me then I have to rely on walking, a neighbor or the public transportation system. In very dense populations this may well be organized to an extend but in my small town I need to walk a certain distance to find a bus that goes every 30 minutes. Taxis are expensive as they do not just charge the fair of my travel from A to B, they also charge their own fair just to come to pick me up. A bus would be fine but it goes only so often. Meanwhile I am used to getting my transportation instantly by walking to my car or bike at my fron door. So if I would want to get rid of my ownership I at least would want to have a reliable equivalent at hand. If I do not own but use then the service of usage has to become better than me as an owner. The consumer society that I live in also requires that I travel between urban centers. The train system has shown important flaws, especially when we have extreem weather. I hate to see myself as single father, with a responsibility at home, stuck on a freezing train station without being able to get home to attend my children. Having my own means at least gives me a sense of control. Not that it is a guarantee that I get there but at least I have my own hands on the steering wheel. I have instant choices. And that feeling of independence is important to me. Mentality also has to do with psychology. Of course I understand that usage instead of property is important from a natural resource or space point of view. And I would be very willing to change my mentality if, and only if, my sense of freedom, security, choice and instant availability would be guaranteed. Ownership provides me with this sense of availability at all times, despite the destructive consequences for my environment. I am conscious of it but also have my selfish attitude. I am willing to jump on my bike when the weather is good, when I feel safe, but do not feel the need or obligation simply because our planet is in jeopardy. Who am I? My neighbors need also their consciousness building. When I see them buying and parking a car in our street for every family member my motivation to relinquish my comfort first has come to a minimum. “Them first” I would be inclined to say, or all at once. Mentality shift has hence to do with multiple factors, not just my own consciousness and sense of responsibility. It has to do with availability of reliable alternatives, an equivalent sense of comfort and recognition of my efforts (I am not alone). Usage is not just confined to the mobility issue, it has to do with all sustainocratic processes around local four local sustainable human progress (food, security, health, wellness and education). When that is organized I would be pleased to try it out, fearfully because of lack of trust, but responsably as a global conscious citizen. So change of mentality requires purpose driven cooperation between institutional AND civil interests. Both have to work together to make it happen. In fact, in an economy based on usage we can learn to respect the usage of our natural resources in a reciprocal way. To do so we would need to address again the essentials of our existence within the context of our natural environment. Sustainocracy is all about that. If we use our environment effectively and with affection we can assure continuity of our existence. But to do so we need to give back what we have taken when we are done. That is the way nature works and it works exceptionally well. In fact, that is the way life and death works also in humankind. When we are born we use material from our environment for our carnal existence and growth. When we die we give it back to our environment through a burial or crematorial. Why wouldn’t we do that with all the other things that we use to serve or please us? We should but we don’t, simply because we are not organized that way. To do so we need to change all our institutions, their way of functioning, as well. When we look again at mobility as significant example we see recently (last decade, with a push forward sinds about 2008) a rapid tendency in urban transformation. This is caused by the expected sharp decline of fosil fuel availability and the rise in cost price. 55% of humankind lives in cities nowadays depending on mobility for everything they need. Industries and governments that have relied for over 100 years on the profits and taxability of cars as a consumable and luxury item. They are now facing an automotive crisis, starting the transformation within a dense urban setting. The maths of car sales and consumption of fuels does not add up anymore in a social and environmental context for the long term. Old business lobbies still remained strong for a while due to the amount of labour and financial interests in this traditional sector but eventually room has been created to develop alternatives. We see now the tendency of new local for local alternatives in mobility with great creativity at business and governmental level. Still, this is confined to the economy of scale presented by the urban concentrations. It could become much more affective if fragmented policy making would be replaced by holistic sustainocratic cooperations. The problem any government faces is that the car with all its fuel consumption was one of the biggest taxable instruments to finance the public administration. It was a real cash cow. Just like housing, energy, communications and food supplies. Now that this income is slowly evaporating a dual problem arises. Sticking to the example of mobility we see that new types of transportation, traffic and mobility require new infrastructures, which is a large investment. Meanwhile we are not entirely sure in which way mobility will evolve. This is also the case for any other human consumable. The old taxable cash cows disappear but nothing is definite to replace them. But the old costs of society keep growing. How do you transform taxation from a consumer to a user economy? Why would taxation need to remain the same? From a theoretical point of view it does not need to be the same at all. A new society would demand a new way of structuring government and by consequence also its finance. But you cannot instantly transform government and its dominated structures s.a. police, defence, infrastructures, justice, education or health care. They have been build up for many decades, centuries even. Restructuring involves large hierarchical structures of people, regulations, laws, positions of power, etc. It takes not only time. It demands general support, vision, hard work and accepting the psychology of change as a common transformative factor in which fear plays the most common human factor. In a democracy a transformation is even more demanding and probably even impossible because of the fragmented party politics that have grown far from a common national purpose. Also people who vote tend to vote for what they have lost and not what they can achieve by working together. 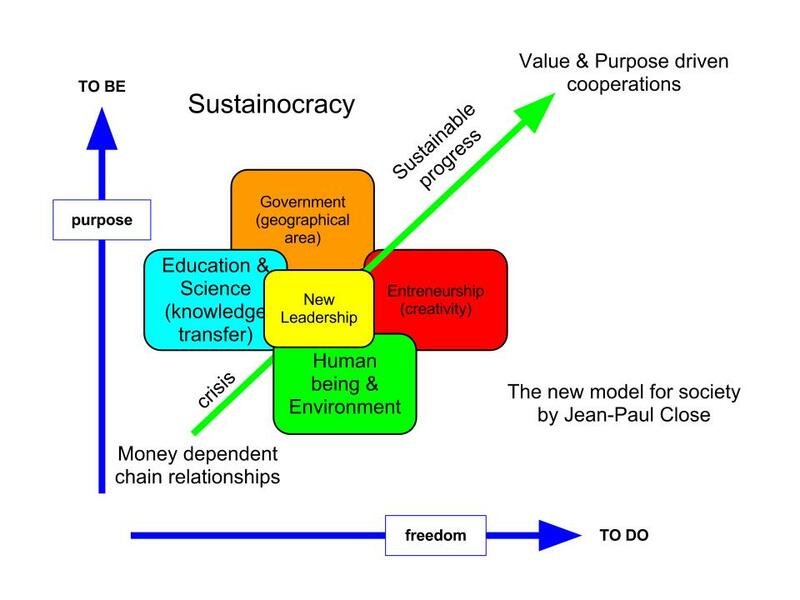 When we take sustainocracy as a new structure for society at least all 4 pillars of society work out ideas together. We all realize that the traditional tax structure and government expenditure needs to be intensely revised. We see that there is a long term continuation of the effects of the old consumer structure on human health and the environmental polution. This affects again the long term government expenditure requirement in health care, and that is not backed by sufficient tax income in the short term of the new structure. Either public debt increases further, or….we all take responsibility (sustainocracy). Everything needs to transform at the same time. Also, business needs to transform. When new entrepreneurial initiatives appear that substitute the old traditional ones we see an equivalent need for transformation of social financing and government responsibility. Business is much more inclined to assume local responsibility for reliable public services in which circular economy of usage replaces the linear economy of ownership. Government is then forced also to change from a regulating and consequence driven authority to facilitating structure that introduce flexibility, transparency in change and cooperation. On the one hand this would attend the uncertainty of the future. On the other hand one needs to spread the investment over all parties and not just through governmental channels. Taxation cannot cover both the government transformation AND social transformation all by itself. Today we see many governments already with a rising national debt beyond reasonable proportions, just to avoid change. More debt to induce change would be unacceptable. Moreover we concluded that a society based on usage requires the transformation of everything, not just government. That is where sustainocracy comes in and places the responsibility with all social parties involved. One single connecting specialist or pair of persons will do the trick. Me for instance. Taxation in the long term in an economy of usage can have similar proportions than the economy of consumption today. The money would however be used in a different way. But in the short term the tax income is much less. We see then a tremendous need to coordinate such transformation step by step in order to avoid a total financial chaos. Tax can then be something more than just money. 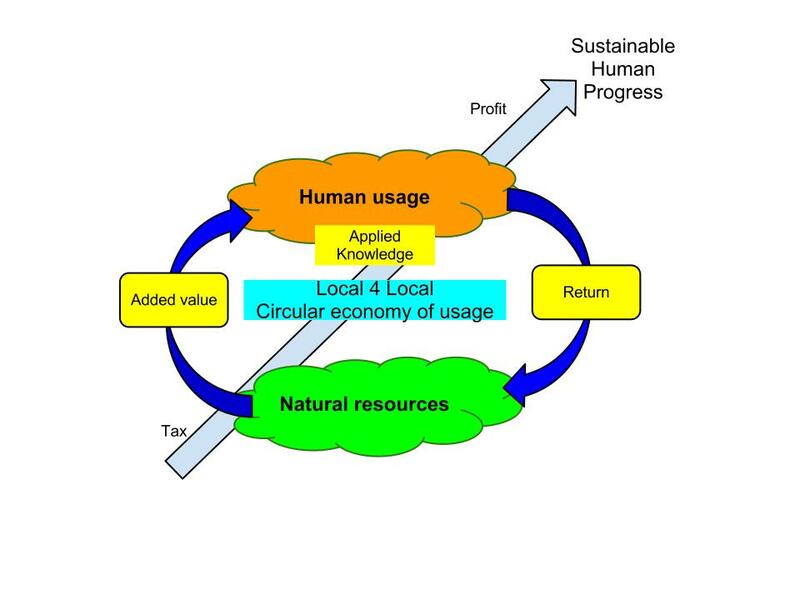 In fact we all become local for local responsible for the circular economy of usage, creating the added value ourselves and sharing the benefits. In the consumer economy we see that people simply need money to keep the economy going. In an economy of usage people need to invest their talent and personal energy to create things to share (s.a. food, energy, housing, etc). Money is less important. Much more important is the level of co-creation. This requires vision and coordination that cannot come from just government itself nor any other institutional structure. They are all too dependent on each other through the old chain of interrelated financial dependencies. The current institutional world would sooner drop into a huge crisis than take the initiative to transform together. That introduces the new connective leadership (no power, lots of authority) of members of the sustainocratic STIR Foundation. They assume the role of new purpose driven leadership that allows the institutional partners to join the challenge based on independent equality, rather than dependent inequality. Each participates with its one levels of power, authority and added value. The challenge is hence extremely local, yet global at the same time, geographical and vertically institutional, and very human as well. It affects for instance the way multinational business develops and transforms from a global manufacturer to a local facilitator. Maybe in between business can still develop a mix of centralized manufacturing specialization and local holistic service responsibilities, with forward and backward logistics and reuse of resources. But if the transformation is not coordinated with business and governance involvement at the same time it will not happen. As a consequence we can very well justify the complexity of the transformation from a logical and even scientifical point of view but not easily from a practical, operational one. We cannot pinpoint anyone today as a sole holistic responsible for sustainable human progress, unless one totally independent person stands up to do so (like I do in Eindhoven). The huge material interests that still make up the old world of the having, the consumer economy, have a tremendous blocking impact on the level of transformative change. This is being countered by a strong building up of explosive (agression) and creative (new initiatives) stress. It is becoming much better for the establishment to join sustainocracy and gain again instruments of effective power then to remain trying to patch up the old system our of unsustainable self interest. Organically change may occur when old age parties find each other in purpose driven sustainocratic missions. But change will also occur through crises en chaos when powerful structures insist on their self interests beyond the limits of the ethically reasonable. There is a balance that needs to be found between the controled temporary maintenance of the old and the speed of change towards the new society. The process can be extremely dangerous for human kind yet can also be changed positively if sustainocracy is accepted by global institutional leaders, together. The theoretical and ideological need for transformation between a consumer and user type of society and economy is beyond dispute. It can be morally, ethically and scientifically proven. The complexity of both mentality change and transformation of institutional positioning is however so large and significant that it takes local and global leadership to make it happen. As such the existing hierarchical leadership is not independent enough from their fragmented structures of power. Holistic leadership only exists at individual human level, cannot be institutionalized, just accepted as linking sustainocrat. The fragmented institutional leadership, no matter how powerful in the old world, will eventually have to join the table of sustainocratic leadership. Institutions are human instruments, like a hamer, a screwdriver or a shovel. If we cannot get humankind to stand above its instruments we will face a huge humanitarian disaster. It is up to the human being in charge of such institutional instruments to accept taking seat at the table of human sustainocratic leadership. The sustainocratic initiatives that we take in Eindhoven and Holland could be a source of inspiration and guidance to avoid human disaster and make change happen in a peaceful way. Then global business, governmental and scientific leadership would have to accept sustainocracy as I present it and join the table for the sake of their own leadership. Since such combination is unprecedented in the world it is hard to establish for the first time. But not imposible as I have done it before. If it is posible on a local for local level for the first time we should be able to address the issue on a global basis too. Worth a try? Why not….Who should be at the table? Who cares to help? By Jean-Paul Close in 5K world, multidimensional world, Society on November 2, 2012 . Hi again, Jean-Paul. As you know, our agendas have similarities, to say the least. I’m a ‘noob’, though, and still learning basics. To me, this whole process started by trying to find an umbrella term for the idea of a society, whose first priority would be true sustainability in terms of our planet’s resources. I was astounded by how little internet buzz such an important idea had generated. I didn’t find consensus of any term, really (in contrast with everybody knowing what for example capitalism or democracy basically means). I found your blog simply by googling all -ism and -cracy words I could think of that could be used to define the aforementioned umbrella term – no other term really had wide support at all. Anyway, if you see sustainocracy’s definition as a very specific one, what do you think would be a probable umbrella term? The umbrella for me is “sustainable human progress” as a common direction for humankind at individual level with institutional support. The type of complex human societal organization that results as a consequence I refer to as a “sustainocracy” which places the umbrella over democratic decision making. In my work I never refer to the word “sustainability” yet always to an ongoing process. I also do not refer just to our environment and natural resources as a single point of consideration. When we do not consider it in awareness and transformation we can scientifically prove that humankind will be decimated. It is hence in the interest of human sustainable progress to take it seriously, so there is no need to insist on this when refering to sustainocracy. There is however a need to call for attention when you refer to the old paradigm of consumer driven economies. But calling for attention will not change the paradigm nor the consequences. The fragmented institutional power position can individually pay attention but individually lack authority and sense of responsibility. The missing link is the sustainocrat (me, you when you become one, if you have the freedom to do so). The sustainocratic represents the human being within the context of its natural environment, not the institution. He/she uses the institutions as an instrument for sustainable human progress. That is a new paradigm that provoques a paradigm shift in each institution at the same instant the decide to participate in the sustainocratic program. So sustainable human progress is the goal, sustainocracy is the means and the transformation is done by a single human being, not an institution. It is not an economy (today’s definition of economy = the science to deal with shortages…i.e. paradox: lack of natural resources will boost the economies yet increase social instability ip to the point of singularity ….collapse). It is a value drive multidisciplinary cooperation (creating and sharing direct human values together in a reciprocal way between people en environment). So in your mind you have to create two different parallel worlds: A (consumer economics) and B (sustainocracy) with the personal and institutional choice to become part of B (motivated by the collapse of A) by accepting an intense transformation. This is a bottom up transformation, starting at individual level and workings its way up into society through local, regional, inter-regional, etc. development. Thank you for your thorough answer! My goal is trying to look into all possible options of global human interaction that might secure this planet’s ability to support life, and so provide a necessary physical platform for any/all causes or development that humanity might come up with, basically. Whatever our personal, spiritual, practical, social etc. goals might be in life (and the fantastic variety of these is a big part of our world’s beauty, in my opinion) we all need a healthy planet be able to endeavor them – hence ‘greatest common factor’. Sustainocracy as you define it sounds like a wise and profound solution. I agree no institution will make this happen for us, it’s the individuals who’ll have to make the change. And I also appreciate the diversity of answers to this question we might collectively come up with, and believe that these answers are not ‘competing’ against each other, but rather adding to each other and together enhancing our possibilities of survival, so balancing some of the destructive ideologies that we’re being offered as options today. In a way I see each individual mind as a singe brain cell in humanity’s big, collective brain. And while no one cell can control the brain, it can choose to produce ideas that are constructive instead of destructive, and interact with other cells to spread this ethos. And the more of these constructive ideas are produced, however simple or even naive they may be at first, the more material we collectively have to create something beautiful with. In practical terms, since we are a social species, individuals can have a hard time acting according to their own ethics, if everyone they know around them act the opposite way. In the ‘developed’ part of the world, they may go to a web browser and start searching for likeminded people. If they find a rich and lively community of people with their various causes inside a common paradigm, they might end up empowered to act up in their personal lives too. As for my name, I apologise for any unpleasantness that may occur because of my anonymity. My motivation is not some kind of a mystical superhero fantasy or anything like that. Rather, on the other hand, I see it as a test of the ideas I write about – if they make sense, they make sense regardless of my person – if they don’t, they don’t even if I was Al Gore or Dalai Lama. On the other hand, I want to protect my person in case my blog receives publicity, as I hope so that it could empower other undecided people like me to join the cause. And when talking about breaking a paradigm, some advocates of the paradigm could answer with personal hatred, especially on the net, and I don’t want that. If some calling name is needed for practical reasons, you can use OG, or whatever feels easiest. Your arguments are perfectly well understood and show a personality in search of answers. Your reflection about history and the way humankind has evolved in its collective search and structuring of answers is also excellent. Yet everything is part of what I call 4th dimensional experimentation. Indeed every human being is then like a cell in a body called humankind. Cells can be wondering around or shaping different, specialised units (organs) like facturies (equivalent to liver, kidneys, etc), government (brains? ), schools (eyes, ears?) etc. When this body is governed by greed it grows illnesses, cancers, etc. If the body is government bij higher awareness then it can cure itself and remain healthy. Key in understanding sustainocracy is to let go of 4D and break through the 5th dimension of understanding. Then you will see that sustainocracy is in fact showing the human body by representing the complexity in health described before. If you draw for yourself the cross of human complexities in my model with the vertical line (to be) and the horizontal line (to do) you can place a head on the top end of the vertical line (consciousness) and hands on both ends of the horizontal line (to do – choices). The intersection of the two lines represents the heart (spirituality and emotions). A complex human society is nothing else than a large group of people that each share the same qualities of knowledge (education and experience), behavior (culture and awareness), environment (local situation) and motivation (action and personal entrepreneurship). Each of these qualities have been organized into institutions: environment -> government, motivation -> business/money, education -> science and behavior -> economic statistics. By giving the institutions statistical dominance over the human being the individual became servant to the system, a number, a robot, a financial entity. The individual became dependent of the umbrella. I have tried all alternatives. They change bits and pieces but never address the holistic requirement of transformation. Only holistically you can relate humankind in a new way with its environment. I have shared podium with Michael Braungart, Ervin Laszlo, people from Biomimicry, The natural step, Transition Towns, etc etc and they all have a solution (not even Ervin Laszlo with his Giordano Bruno Gobal Shift university) for a piece of the puzzle but we need to change the entire puzzle. That is why I take the liberty of stating that only sustainocracy turns the human world upside down because it brings the institutional world back into human dominance. Key is higher consciousness to make it happen locally, not power or money driven, but simply using the purpose driven authority of being human. Our planet Earth has survived huge external impacts, other dominant species prior to the human being, and survived with its remarkable potential of finding new balance. It will survive humankind also. The question is not therefor how we can save our planet. We should be concerned on how we save ourselves as self aware species? Only recently, with the explosive growth of the global population, our lifestyle and culture of economics based on consumption, we realize that we are on a rapid crash course for ourselves. We also realize that we cannot change the institutionalized financial dependencies without affecting the others in the chain of dependencies. Institutional self interests battle a war of their own that has nothing to do with human or planetary evolutionary interests, just interests of the fake and destructive parallel world that we have created over time. To break through we need to get ourselves back into the natural universe where different rules apply. There is no middle way. Thank you for your input in this refreshing conversation – indeed this machine we’ve build for ourselves has taken control, and we’ve willingly given away that control. The routines of everyday life tend to consume a lot of the intellectual capacity we could be using for healthier development, especially knowing these routines serve institutions that we know deep inside are destructive. It’s invigorating to learn of other people who prefer to think in terms of centuries and all of humanity. It’s a funny thing, but you have to overcome a certain shame, or fear of getting embarrassed, just to talk about these things – though it should quite the contrary be something to feel proud of. I guess this too is a part of the repressive mechanic: we tend to fear fundamental changes and thus keep an eye on each other and easily mock those who try to think too far outside the status quo. All credit to the people who volunteer for various grassroot level causes, their work is precious. It’s just that sometimes the endless stream of grassroot initiatives combined with a common lack of vision about the deeper mechanics of humanity, (ie. curing symptoms instead of the illness, that as far as I understood you’re talking about also) gets very tiring. I agree Earth will ‘survive’ everything – or, as I tend to think, Earth has no need to ‘survive’ anything per se. As the universe is perfectly neutral or equal about its every particle, it doesn’t ‘prefer’ living matter over any other material, and thus, from universe’s ‘point of view’ Earth would still be perfect if only cockroaches lived here, or even if it was just a ball of rock and water. If then a few bacteria cells happened to hit the ocean, it would all start over, and that would be perfect also. In philosophical sense, there’s certain beauty in the thought. Practically, though, most of Earths survival or adapting scenarios include discarding humanity or most of it, and being a human being, those options are not exactly pleasant. So, my premise may need a small adjustment – we need a planet that can support life AND still include humanity in the equation 🙂 In other words, yes, humanity is what needs to adapt, so that we don’t remove ourselves from the perfect equation. And no, this can’t be done from inside today’s culture or society, we need a fundamental change. The life you describe could be more balanced and satisfying that anything we’ve had before, and I’d surely like to live in a world like that. What I’m a bit doubtful about though, is how can the majority of people rise quickly enough onto a higher lever of awareness that would be required to be able to achieve a society like this. It may be that I’m thinking overly ‘nobly’ about the word awareness and you perhaps have more practical connotations to the word than I do. But I mean, what I think is human awareness tends not to be a constant state in the end of linear development, but rather a volatile thing that requires constant concentration and input of mental energy. So many people concentrate in other things in life, I have a hard time believing such a great mass of people could be willing to work in such a perfect unison with a common focus. My gut feeling is, it could take hundreds or thousands of years of human develompent to reach such a level, and we only have something like a century, fifty years, maybe two hundred years before we end up removing ourselves from the equation. So, perhaps we need a backup plan of sorts? How could we solve the acute environmental crisis to buy time for this more profound development? A rescue plan that would accept people as we are right now – far from ideal, that is – and see what we could do with that material to achieve our common goals? Self awareness is common in various species, not just the human being. Self-consciousness is a next step, a learning experience of auto-feedback and reflection. It includes all human behavioral patterns including the herritage from our animal ancestors. We had to compete an evolutionary battle and can only have done that as a species with a high level of greed and aggression. Ever since our dominance we have been challenged first to learn to understand and control ourselves rather than the universe. Our evolutionary challenge for over 250.000 years has been to leave our animal roots behind us. When we look at our systems of control today we are still governed by those elimentary roots of greed, territorial behavior, competition, hoarding, etc. It all has to do with fear. Fear for losing what we have, even our own carnal life. But it is not always like that. People who suffer a deep encounter with their true inner self, after a near death experience or severe suffering, a trauma, connect to an inner strength, a type of energetic current that links directly with the eternal powers of the universe. It is a unique experience. It happened to me twice. The first time I was fearful of letting go fear. I couldn’t believe in life without fear. The second time it became a calling. Now I have no problem to travel between the world of abstraction and back to the the daily carnal concerns. It is all like a stage in a theater to me. Humankind is performing an evolutionary act and I watch it, influence it. No you do not need the mayority of people to cross that line of higher consciousness. You just need ONE. This person, like me, asks others “what do you take responsibility for?” and asks them to take co-creative responsibility with him or her, with me in my case. I take responsibility for humankind every day and ask people to join me. I do it on a very small local scale but that is humankind too. They feel insecure and we commit together that we create security by creating proof to each other. I eliminate their fear by trying to create some perspective of security. We relate on the basis of equality and trust. That works easiest with people who had to let go of very much of their material securities (the poor, the homeless, the jobless, etc). They have nothing to loose. The article will introduce sustainocracy within the context of human evolution. My findings oblige me to set up a new age university because the establishment will logically not accept it, individuals will. Despite the gigantic global challenge of humankind as a species within the material confinement of our planet Earth we need to consider ourselves citizens of the universe. From an evolutionary point of view the solar system is ending in an expected 3 billion years. If we are conscious of this we have only this time to learn how to behave on small spaceships like Earth or much smaller, or find other ways to populate the universe. We cannot expect to find banks, left or right wing governments, or business enterprises with logistic retail establishments out there to provide us with food, wellness, health, knowledge or a house to live. If in the complexity of space travel “value” is expressed in true tangibles like this and not in money, why should we then claim otherwise on Earth? We now learn nothing. If you look down at earth from the ISS and feel fragil in a small tin can hanging out in space, the cradle of birth of humankind looks extremely valuable and unique. Our puberty, as you mentioned earlier, is now to learn how to behave as an adult species. Only them we can widen our horizons and become eternal. Thanks for your clarifications; as I thought I had different connotations with the words awareness and consciousness – English isn’t my my mother tongue either. I have thought a lot about our systems of control you also wrote about. It’s true that they’re basically extensions of the behavioral patterns we had when we lived on the mercies of nature. Furthermore, the underlying problem seems to be that people generally have the tendency to think of these systems, and human behavior in general, as fundamentally rational and moral, and that leads to a lot of ill-fated misconceptions. To me, it rather seems we’re fundamentally a social and intuitive species, instead of rational and moral. We have a natural tendency to rationalize our intuitive behavior, but it doesn’t make it rational. What I would like to see instead, is looking at ourselves as is, as the social animal with relatively high intellectual capacity that we are (at least as I see it). To collectively admit these things, would perhaps be the first step to start creating behavioral patterns that could be a lot more fitting for our species at its current stage. Be it as it may, I think your philosophy as you describe it is the most profound no-nonsense philosophy I’ve encountered, including the ‘ancient’, authorative ones, and for example capitalism (that in theory should be no philosophy at all, just an economic system, but in practise seems to be the only philosophy, however naive, to millions and millions of people – how sad is that?). I’ll surely look more closely into the links you sent me, thanks for them! Yet, I’m intuitively wary of the notion that any one individual could know the absolutely correct and definitive answer to humanity’s core questions – nothing personal, mind you, I’d say this to Einstein, Buddha and Jesus aswell 🙂 So, I guess I’ll go on this path for myself – if you’re correct, and I won’t be lead astray by one of my several blind spots as a human being, I’ll be seeing you sooner or later where you stand at. In the meantime, let’s do continue this invigorating discussion and co-operation (at least it has been that to me) here at our blogs and Twitter. Thanks for the time and energy you gave in the form of your messages, I have a new feeling of empowerment already. Of course it is your individual voyage through awareness and consciousness. I am just an modest insignificant teaser that you have found on your path. The question that I have been struggling with is the possibility to guide humankind into a new and safer paradigm through insight? Or can only greed created human organizations of power? Is the divine learning process a generic consequence of accepting our failures when our environment breaks through our collective blindness? The latter has been our organic progress, without any guidance of the conscious, just modernised opportunism in any timeframe. Is there then a natural selection taking place, not on the level of the indivdiual strongest but also on the growing complexity of organizational wisdom? Can we learn to avoid chaos by accepting crisis as a signal to our conscience for change? Is there a way that enlightening guides us in a structured way, instead of having to rely on organic destruction to open up for conscious renewal? That I am maybe one of the first to define and take responsibility is just a matter of universal timing with the type of life I conducted. I am not better or worse than anyone else. I do not possess any truth nor power other than life itself and what I do with it. I do admit that I have been enlightened through special insights that “occurred” to me and people that miraculously crossed my path to hand me keys that I needed to unravel my own understandings. But I also believe that life got me into a situation that I could open up to it in a unique way. Many others use personal enlightenment to go from a complex paradigm to a simplified way of life. My personal mission is to go from complex to complex in a transformative way. My own self is insignificant. I am only instrumental to make it happen and create a precedent that inspire others to do the same. I cannot change the human world. I can only change myself and with my change the entire world has already changed. It is a great pleasure to exchange views with you. I do this all the time. The university of higher consciousness is free of charge, not free of commitment. All I ask in exchange is to become truthful to sustainable human progress (starting with your own). The definition can be found in one of my blogs of 2011. It is one that everyone can take instant responsibility for. The rest….will be an automatic consequence. I do not lead, sustainable human progress does. You then lead yourself. The pleasure is all mine. As I see it, when the time is ripe for a fundamental change, for a brief moment one or more individuals do turn into catalysts of that change – dependless of their personal properties they become a symbol of a larger group’s shared goal. It has happened several times during our history (Bouazizi and the ‘Arab Spring’ being a very recent example, although I don’t necessarily agree on harming oneself as a way of communication). Can individual insight change the course of all humanity? Or are we ‘prisoners’ of statistics and probabilities? That remains to be seen, but I think there’s hope. Although we’ve never collectively been in the exact same situation we’re in now, I think there’s a lot to learn from analoguous situations on global and also individual scale. I wasn’t joking when I said former heroin addicts could have useful knowledge on how to rip oneself out of a severe addiction, how to deal with the symptoms and how to live with the constant grieving withot relapsing. Now I’m of course talking about ‘short term’ development again, in terms of decades or centuries and the ecological overshoot. The universe is cyclic and repetitive in nature, and if we use our perception, intuition and logic, I believe we can find lots of ‘tips’ on how to survive our biggest challenge so far. As for the unanswered question of individual’s affect, I see it analoguous to a situation where you need to change the course of a very heavy moving object with very little force. If your timing is wrong or you try to push against the full force of this object, you make no difference at all – but, if you understand physics, and apply the force just right, you can make all the difference. Some martial arts, like Jujutsu are good examples of this. It’s basically the same thing with the course of humanity, too. Individuals won’t make any difference if we push against the whole force of history (unrealistic goals), but if we join forces and ‘push sideways’, so to say (realistic, yet ambititious goals) we just might succeed. We’re having a very interesting discussion with Jean-Paul Close in the comment section of this post of his. Thankyou for reblogging. Hopefully all this inspires others also. You use similar metaphores as I. Interesting! In my view a single person can indeed make a difference. It happened so often before, in fact real progress is made by them, the rest following afterwards. Think of electric light, telephony, anti biotics, motorized vehicles, flighing, etc. These are all fragmented elements that changed our life for ever. From an organizational point of view we can also name a lot of influencers. The point I am try to make is that we are on the verge of a quantum leap, something that affects everything and everybody, with sustainocracry paving the way. You are of course right that letting go of fear and our old securities is like have to rehabilitate from a severe drugs or alcohol addiction, even worse since the “dealers” that have interest in our addiction control this still by law. They created a world view of greed that is considered “just” while from a sustainable progress point of view it is exactly opposite, repulsive even. Many institutional leaders do not want to open up to a paradigm shift because if they do they could be made responsible for not doing it earlier. Negation is a great tool to avoid change and maintain status quo. Key in sustainocracy is that we produce transformative change but still allow institutional leaders to exert authority and power, only in a different way. I just place the pieces of the puzzle in a different way on the board and let them interact on the basis of talent and equality, not based on financial inter dependencies. I even applaude effective use of authority to make things happen. Business and social leaders find it great to participate because they can in fact become truly powerful again. In the old paradigm, whatever they do, it all stressfully falls apart. In sustainocracy it all builds up. They only thing they need to do is commit to the process and make it happen with the talent they can offer. The latter is often difficult and provocative because over time their only remaining institutional excellence is manipulation, financial tricks on KPI’s, scale development and short term hit and run focus. When I ask them to show their true innovative capacity and added value they often need to do some research. This in itself is an eyeopener that creates a transformative basis that I have nothing to do with. It is a mere consequence of their own awareness and strategic intellect and seethe chances a repositioning offers. They need to convince their stakeholders or they leave the company and start a new one that does fit in without blockage. Sustainocracy is a local 4 local means that applies globally. Anywhere in the world we can find points of unique stress in sustainable human progress (food, health, security, wellness, housing, cohesion, education, etc) that is about to collapse. This is the point of inertia where sustainocratic cooperation can make a difference. The abstraction of human progress is then refined into a complex but concrete issue. When this is started it rapidly become holistic. I create the precedent and local people anywhere in the world pick it up and start their own process, with or without my support. Multinationals involved in my own precedent in Holland act as ambassadors in other countries. Governments in financial stress are looking over the shoulders of Eindhoven to se what we do. All I need to do is make it known worldwide, like through this blog, show that it works (like AiREAS, STIR and EQoL in Eindhoven) and offer effective support free of charge but with sustainocratic commitment throughout the world (STIR University). Then one gets multiple stones rolling at the same time. The most difficult one is the very first one, but that one is rolling now. The next few are tough and the rest is automatic. The universe maybe cyclic in various plains. Human progress is cyclic in an upward spiral from a consciousness point of view. After every swoop through chaos we have added something to our existence and enhance our presence. The current swoops have added indepth technological and scientific know how, globalization, space travel and open source multimedia (mobile) communications. The next swoop is a quantum leap, a break through, the second one in our history. I’d send you my article on this if I had an emailadress. Anyone reading this who would like to receive it can ask me directly: jp@stadvanmorgen.com. Else you’ll have to wait until it comes out through the Ethical Projects publication that is due the coming months and will become worldwide available through Springer. Actually I’m not all that surprised, if our metaphors turn out to be similar… it’s just another example of how nature works. It’s like Legoland; everything you can imagine is there, and every building and object is unique, yet they’re all made of Legos, no exception. No two persons are identical either, but we’re all made from same building blocks. In similar situations, and having lived in similar cultures, it’s no wonder our minds make similar connections when we think about same problems. It’s the synergy of universe, and it can make all the change. I find your initiatives great, and it fills me with hope to see that they’re already in a concrete prototype phase. I’ll be studying your writings and the logic of sustainocracy more thoroughly in the coming weeks. I’d be happy to read the article you mentioned! My email address is “ourgreatestcommonfactor” + the at sign + “live.com”. My personality has always been that of a ‘thinker’ and a ‘communicator’ rather than ‘doer’, so I know already I won’t be in the concrete front lines laying bricks or anything like that… I like my warm, cozy blanket of fear too much. But I will keep on studying areas relevant to sustainocracy, trying to find aspects to our surroundings that would make it easier for people start spreading the medicine instead of the disease, and keep on writing about these things. I’ve never been good at shouting in demonstrations, but I do know how to crystallize complex data into short, compelling visual and textual messages, and I believe these are the areas I’m more useful to the cause anyway.